One: Bezos is really looking out for the best interest of Amazon employees. Amazon is the second largest employer in the United States. Its CEO just overtook Bill Gates as the richest man on the planet. It’s hard to square that reality with the working conditions of the 575,000 Americans Amazon employs. 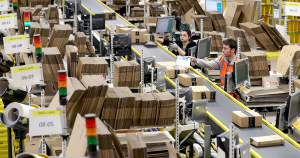 Reports claim employees have to pee in bottles to keep up with the relentless pace at Amazon’s factories (an Amazon spokesperson tells Futurism this claim is “quite simply not true. Amazon ensures every associate has easy access to toilet facilities which are just a short walk from where they are working. Associates are allowed to use the toilet whenever needed”). The Economist found that Amazon warehouses openings actually caused the wages to drop at other warehouses in the same regions. But the days of sub-par working conditions are behind us, right? On Monday, the online retailer announced it would raise the minimum wage to $15 an hour for some 250,000 workers. It’s not a fluke: some of those employees will see significant boosts in income. Amazon is even announcing it will advocate for a higher minimum wage on a federal level in Congress. But what drove the company to announce this now? Compensating Amazon workers fairly is an inherently good thing, but the timing of such an announcement is a little suspect. You can bet that Amazon didn’t get to its #324 rank on Forbes’ America’s Best Employers list by offering outstanding benefits that cost the company. But maybe Bezos has a heart, after all. What brand would want to be associated with atrocious working conditions (Amazon refutes the idea that its workplace conditions are “atrocious” in the first place. “The top priority of our fulfillment center network is safety,” a spokesperson tells Futurism)? Here’s one for the skeptics out there: maybe raising the minimum wage of Amazon workers was a play to keep employees from working for smaller competitors, or even steal workers from smaller competitors, as an opinion piece in the Wall Street Journal suggests. To take the argument further, lobbying Congress to raise the national minimum wage will also raise costs for Amazon’s competitors. And not every small business will be able to afford to compete with Amazon’s wages. Senator Bernie Sanders (I-VT) has been on Amazon’s case for a while now. Back in August, Sanders openly called out Bezos for mistreating workers, and Sanders was hardly the first to do so. Bezos might be aligning his company with the left in the U.S. to get ahead the “blue wave” — a wave of Democratic wins for House and Senate seats in the last couple of months leading up to the midterm elections. Sanders seemed to be satisfied by the $15 minimum wage announcement and urged other companies to follow Bezos’ lead. “You cannot continue to pay your workers starvation wages,” Sanders told CNN‘s Wolf Blizter in an interview. “Learn from what Bezos has done. He has done the right thing. You have got to do it as well.” The rest of the appalling work conditions? Well hopefully Amazon will just figure it out. Amazon has been suppressing all of its employees’ efforts to unionize ever since the company was founded in 1994, The Guardian reports. A higher minimum wage often reduces employees’ desire to unionize to fight for better working conditions (at least a little bit). “And now, amid growing labour unrest and intense anti-union activity on Amazon’s part, a conveniently-timed wage hike,” as Motherboard notes. Amazon has made the right decision to hold itself accountable for paying (at least more of) its half a million employees a fair, livable wage, and fighting for more companies to do the same. Bezos is not a hero, and it would be a mistake to call him that. Money talks — and that goes not only for all the minimum wage earners out there, but especially for the richest man on the planet. Update (10/9/18 at 1:03 PM ET): This article has been updated with responses from an Amazon spokesperson.